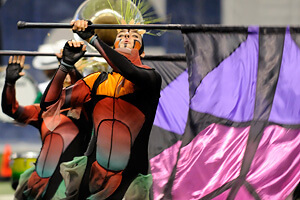 Color Guard: The Cavaliers (18.6), July 24, San Antonio, TX Open Class: Brass: Revolution (14.3), July 24, San Antonio, TX Percussion: Revolution (16.6), July 24, San Antonio, TX Color Guard: Revolution (14.0), July 24, San Antonio, TX View all scores and recaps. • Three corps exceeded 90 points for the first time in San Antonio, Texas on July 24, including the Cavaliers (91.05), Blue Devils (90.95) and the Cadets (90.40). Coming close at that same event was Carolina Crown who was just 0.45 from reaching the mark. • The Cavaliers have put up a winning score at every event they've been at since June 19 in Austin, Texas. 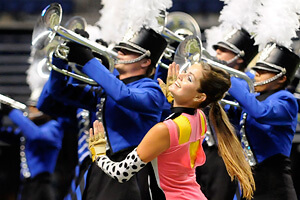 While the corps won on July 24 in San Antonio, its spread over the competition has decreased dramatically, experiencing its smallest margin of victory over the Blue Devils by just a tenth of a point. • When comparing scores from the Minneapolis (July 16) and San Antonio (July 24) events, three corps were able to increase their scores by five or more points in a matter of a week. Those groups included Santa Clara Vanguard (5.3 point increase), Boston Crusaders (5.15 point increase) and the Blue Devils (5 point increase). • The Cadets are staying within striking distance of first place, scoring as close as a tenth of a point from the Blue Devils on July 22 in Houston, Texas and just 0.25 from tying the Cavaliers on July 20 in Broken Arrow, Okla. • In Denton, Texas on July 21, the Blue Devils finished 1.15 down to the Cavaliers and only two tenths above Carolina Crown. Just three days later BD narrowed the gap on the Cavaliers to a tenth, and increased its spread on Crown to 1.40. • Troopers and Spirit of Atlanta have been finishing back and forth. 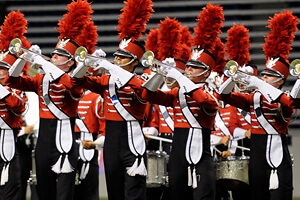 Spirit finished 0.55 ahead of the Troop on July 19 in Wichita, Kan., Troopers finished 1.45 ahead of Spirit on July 21 in Denton, Texas, and Spirit was back ahead in San Antonio on July 24 by 0.50. • While the Troopers finished ahead of the Glassmen on July 19 in Wichita, Kan., in three subsequent meetings, the Glassmen have put up scores 0.50, 0.35 and 0.05 above Troopers. • After the Madison Scouts topped the Boston Crusaders in the two corps' first 11 matchups this summer, Boston finally scored ahead of Madison on July 21 in Denton, Texas. Since Denton, Boston has been out in front scoring 0.50 ahead in Odessa (July 22) and 0.75 in San Antonio (July 24). • Competition among Open Class corps was relatively quiet this past week as West Coast corps began their trek to the Midwest. Several Open Class-only events are on the schedule for this coming week including July 29 in Niles, Mich., July 30 in Paw Paw, Mich., July 30 in DeKalb, Ill., and July 31 in Battle Creek, Mich.
Murfreesboro, TN Niles, MI Saturday, July 30 Atlanta, GA Paw Paw, MI DeKalb, IL Sunday, August 1 Summerville, SC Sevierville, TN Rice Lake, WI View the complete 2011 DCI Tour schedule.